You are here: Home » Is Jon Snow Being Resurrected for ‘Game of Thrones’ Season 6? GoT Season 6 teaser poster. Photo Credit: HBO. Jon Snow is alive. At least that’s the rumor after the Game of Thrones official Twitter feed posted a photo of actor Kit Harington donning his signature black cloak, looking bloody but breathing (along with the word “April,” implying that Season 6 will be returning, as expected, in late April 2016 — yes, that’s right, winter is coming late this year). Game of Thrones is no doubt infamous for its proclivity to kill off our favorite characters in a cruel and heart-wrenching fashion. But after the Season 5 finale, many die-hard fans refused to believe that their pretty-boy favorite had been put on the chopping block. The last we saw of Jon, he was lying in a pool of dark blood after suffering a mutiny — several brothers of the Night’s Watch had just taken turns stabbing him for being a “traitor” by allying with the Wildlings. Of course, to drive the knife in even further (pun intended), the cherry on top shocker was that Jon’s faithful squire Olly (Brenock O’Connor) gave the final stab. This kid is just on a roll, first killing Jon’s beloved Ygritte (Rose Leslie), and now this. Although Jon was left cold, alone and presumably dead, his demise has been the topic of debate since June; and now fuel has been added to that fire thanks to this teaser poster. It seems Game of Thrones is not content in letting The Walking Dead get all the hype over the alleged death of a beloved character (#TheWalkingThrones #GameofDead). There’s still hope that Glenn’s (Steven Yeun) watch has not ended — some suggest he rolled to safety underneath a dumpster after last being seen in The Walking Dead trapped under a dead guy who was swarmed by flesh-eating zombies, leaving room for the imagination. But Glenn and dumpster theories aside, there has been mounting evidence that Jon Snow will be resurrected from the dead. For one, Harington has been spotted in Spain and Belfast — two known Game of Thrones filming locations — in costume. Although it could be just to film a couple flashback scenes, Harington himself seems to suggest otherwise. “Let’s just say that Game of Thrones will remain a part of my life for a while, I’ll probably be in my thirties when it’s over,” the 28-year-old told Dutch magazine Humo in September. And let’s not forget that hair! Harington may have cut his hair immediately following filming last January to the horror of many, but his luscious curly locks are now back to the hair length he was contractually obligated to maintain on the HBO drama. Harington has been honest in the past about his dislike for the popular cut; however, he was quick to point out that if it’s for a role, then that’s another story (like in Pompeii, for example). It remains to be seen what this might mean, with some fans suggesting that Lady Melisandre (Carice van Houten) will resurrect Jon with her Red Magic — we’ve seen it done before in the case of Beric Dondarrion. Another less likely theory is that Jon learned to “warg” like his half-brother Bran Stark (Isaac Hempstead Wright) and transferred his soul into his direwolf, Ghost, just before he died. 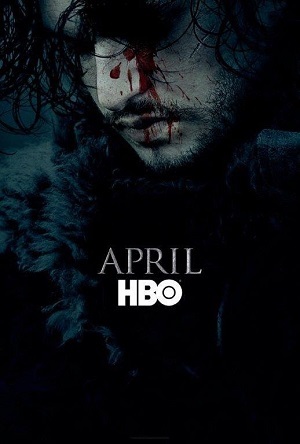 And then, of course, there’s also the possibility that Jon himself has turned into a White Walker, which would explain his icy blue complexion in the poster (though that could just be the result of him lying lifeless in the frigid cold). As far as we’re aware, there are no rules when it comes to Game of Thrones (hello, the Red Wedding anyone — yes, we’re still talking about it). And despite what the producers, actors and HBO’s president Michael Lombardo may say, they’re not likely to give away their secrets either way. So while the controversy continues about Jon’s fate and what this could mean for the storyline, dead or alive, we will definitely be returning for Season 6 to find out what happens next. What are your theories: Is Jon Snow back for another season? Sound off in the comments below!